Osteoarthritis is a degenerative condition as a result of mechanical overload in a weight bearing joint. Hip osteoarthritis mainly affects the articular cartilage, as well as causing changes to the subcondral bone, synovium, ligaments and capsule. This degeneration lead to loss of joint space, which can potentially be symptomatic. It is one of the top 15 contributors of global disability. Hip osteoarthritis is prevalent in 10% of people above 65, where 50% of these cases are symptomatic. The hip is defined as the second most painful joint (after the knee) as a result of osteoarthritis according to a Italian study. 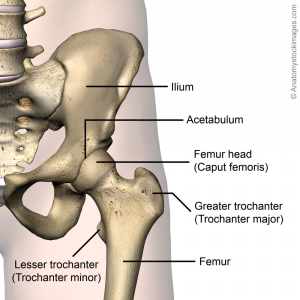 For detailed information, see the hip anatomy page. Mostly caused by abnormality of the articular cartilage, but can also be a secondary result of developmental changes and abnormalities such as femeroacetbular impingement. Abnormalities normally include acetabular displasia. Pistol grip deformities are seen in some cases, mostly linked with slipped upper femoral epiphysis. Although seen as a specific condition, it is often linked with metabolic abnormalities. Secondary osteoarthritis is caused by predisposing anatomic abnormalities such as developmental or congenital deformities. 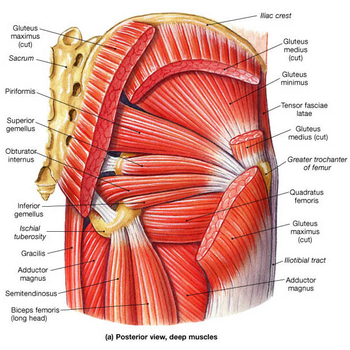 Scour test: external and internal rotation in abduction and adduction of the hip. Patrick’s or FABER test: flexion,abduction and external rotation of the hip. Early signs of hip osteoarthritis is limited abduction and rotation. As the disease progresses, flexion, extension and adduction becomes more difficult. Hip osteoarthritis can be diagnosed by clinical presentation only, but special investigation (e.g. x-rays) are vital to monitor the progression of the disease. X-rays: Findings include joint space narrowing, marginal osteophytes, subchondral sclerosis, and bone cysts. 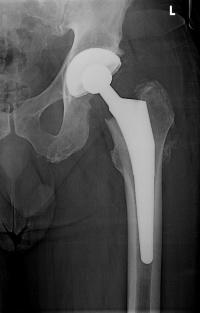 This is normally the first investigation done that aids in the diagnosis of hip osteoarthritis. MRI: More effective in detecting early change in the bone structure, such as focal cartilage defects and bone marrow lesions in the subchondral bone. Medical management of hip osteoarthritis focuses on treating the symptoms. Effective disease-modifying interventions have not been estabilished yet, thus a major focus should be on primary prevention strategies. The optimal management of hip osteoarthritis consists of a combination of pharmaceutical and non-pharmaceutical treatment modalities. It is also important to take the patient's wishes and expectations into consideration. Consider when patients are having flare-ups and is not responding to paracetamol and NSAIDs. 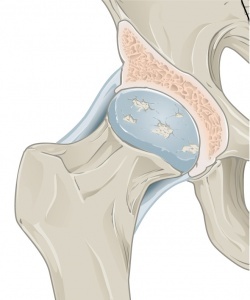 90% of total hip replacements are done as a result of end-stage hip osteoarthritis. It is a successful orthopaedic procedure in the treatment of hip osteoarthritis, when conservative management has failed and is highly effective at relieving symptoms. This is normally done for the younger, more active population with painful dysplasia and deformities. An osteotomy is preformed to realign the hip joint to lessen pressure. This is not a common in the treatment of osteoarthritis. Physiotherapy plays in major role in the management of patients with hip osteoarthritis, with special focus on pain management and functional adaptions. Patient-specific exercise programmes has shown to decrease pain and improve function in hip osteoarthritis. A biopsychosocial approach to the management of hip osteoarthritis leads to patients experiencing less anxiety, even though the condition may not always improve. It is important to consider the rest of the multidisciplinary team as well. Dietitians, occupational therapists and psychologists can play an important part in the management of hip osteoarthritis. Mobility assistive devices like walking sticks/canes, crutches, or walking frames can improve mobility and independence of the patient. Occupational therapy also plays a role here, as they often also assists the patients with functional assistive devices like a long-handled reacher to pick up low-lying things, which will helps to avoid movements that may cause pain. Exercise therapy is an effective treatment modality for hip osteoarthrosis. Specific exercises can increase range of motion and flexibility, as well as strengthen the muscles of the hip and leg. Physiotherapists work together with the patient to develop an individualized, customized exercise program that meets the needs and lifestyle of the patient. The benefits of exercise can assist the patients in their self-management of hip osteoarthritis. Hydrotherapy is effective in the management of hip osteoarthritis. The combination of buoyancy and the reduction of gravity greatly assists patients that are struggling to weight-bear as a result of the pain from the hip osteoarthritis. A study on a 6 week education and exercise programme has shown significant and sustained improvements in pain and disability on patients wait-listed for joint replacement surgery. Further positive results included improvements in function, knowledge and psycho-social aspects. Clinical trials further suggest that it can postpone the need of total hip replacement surgery. Research is inconclusive on the effect of manual therapy in the treatment of hip osteoarthritis. The immediate effect of a manual therapy, specifically joint mobilization decrease pain and improve hip range of motion, especially in the elderly population. Joint mobilization might reduce pain, might ‘provide a stretching effect on the joint capsules and muscles, thus restoring normal arthrokinematics or may induce pain inhibition and improved motor control’ and might reduce kinesiophobia. Patient workbook on "living with osteoarthritis"
Management of hip osteoarthritis varies according to the severity of the condition. A combination of pharmaceutical and non-pharmaceutical modalities is recommended for the optimal management of the condition. Physiotherapy plays an important role in customized exercise programmes for patients living with hip osteoarthritis. ↑ 1.00 1.01 1.02 1.03 1.04 1.05 1.06 1.07 1.08 1.09 1.10 Murphy NJ, Eyles JP, Hunter DJ. Hip osteoarthritis: Etiopathogenesis and implications for management. Advances in therapy 2016;33(11):1921-46. ↑ 2.0 2.1 Cooper C, Javaid MK, Arden N. Epidemiology of osteoarthritis. In: Atlas of Osteoarthritis. Tarporley: Springer Healthcare, 2014. p22. ↑ Cross M, Smith E, Hoy, Nolte S, Ackerman I, Fransen M, Bridgett L, Williams S, Guillemin F, Hill CL, Laslett LL, Jones G, Cicuttini F, Osborne R, Vos T, Buchbinder R, Woolf A, March L. The global burden of hip and knee osteoarthritis: estimates from the Global Burden of Disease 2010 study. Annals of the Rheumatic Diseases 2014;73:1323-1330. ↑ 4.0 4.1 4.2 Nüesch E, Dieppe P, Reichenbach S, Williams S, Iff S, Jüni P. All cause and disease specific mortality in patients with knee or hip osteoarthritis: population based cohort study. Bmj 2011;342:1165. ↑ Cimmino MA, Sarzi-Puttini P, Scarpa R, Caporali R, Parazzini F, Zaninelli A, Marcolongo R. Clinical presentation of osteoarthritis in general practice: determinants of pain in Italian patients in the AMICA study. Seminars in arthritis and rheumatism 2005;35(1):17-23). ↑ 6.0 6.1 Ganz R, Leunig M, Leunig-Ganz K, Harris WH. The etiology of osteoarthritis of the hip. Clinical orthopaedics and related research 2008;466(2):264-72. ↑ Harris WH. Etiology of osteoarthritis of the hip. Clinical orthopaedics and related research 1986; 213:20-33. ↑ Hoaglund FT, Steinbach LS. Primary osteoarthritis of the hip: Etiology and epidemiology. Journal of the American Academy of Orthopaedic Surgeons 2001;9(5):320-7. ↑ Reginister J-Y, Pelletier J-P, Martel-Pelletier J, Henrotin Y, editors. Osteoarthritis: Clinical and experimental aspects. Berlin: Springer, 1999. ↑ 10.0 10.1 10.2 10.3 10.4 10.5 American Academy of Orthopaedic Surgeons. 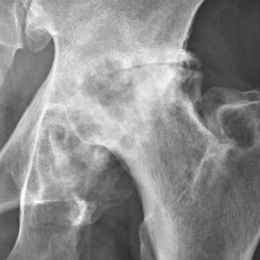 Diseases and conditions: Osteoarthritis of the hip.https://orthoinfo.aaos.org/en/diseases--conditions/osteoarthritis-of-the-hip (accessed 14/07/2018). ↑ 11.0 11.1 Crielaard JM, Dequeker J, Famaey JP, Franchimong P, Gritten CH., Huaux JP. Osteoartrose. Brussels: Drukkerij Lichtert, 1985. ↑ 12.0 12.1 Walters J, editor. Orthopaedics - A guide for practitioners. 4th Edition. Cape Town: University of Cape Town, 2010. ↑ Kim C, Nevitt MC, Niu J, Clancy MM, Lane NE, Link TM, Vlad S, Tolstykh I, Jungmann PM, Felson DT, Guermazi A.. Association of hip pain with radiographic evidence of hip osteoarthritis: Diagnostic test study. BMJ. 2015;351:5983. ↑ Fernandez M, Wall P, O’Donnell J, Griffin D. Hip pain in young adults. Aust Fam Physician. 2014;43(4):205–9. ↑ 15.0 15.1 15.2 15.3 15.4 15.5 15.6 Bennell K. Physiotherapy management of hip osteoarthritis. J Physiother. 2013; 59(3):145–157. ↑ Sutlive TG, Lopez HP, Schnitker DE, Yawn SE, Halle RJ, Mansfield LT et al. Development of a clinical prediction rule for diagnosing hip osteoarthritis in individuals with unilateral hip pain. J Orthop Sports Phys Ther. 2008;38(9):542-50. ↑ Brandt CD. Diagnosis and non-surgical management of osteoarthritis. USA: Professional Communications, Inc. 2010. ↑ 19.0 19.1 19.2 19.3 19.4 19.5 Zhang W, Doherty M, Arden N, Bannwarth B, Bijlsma J, Gunther KP, Hauselmann HJ, Herrero-Beaumont G, Jordan K, Kaklamanis P, Leeb B. EULAR evidence based recommendations for the management of hip osteoarthritis: Report of a task force of the EULAR Standing Committee for International Clinical Studies Including Therapeutics (ESCISIT). Annals of the rheumatic diseases 2005;64(5):669-81. ↑ Saw MM. The effects of a six-week physiotherapist-led exercise and education intervention in patients with osteoarthritis, awaiting an arthroplasty in the South Africa [dissertation]. Cape Town: University of Cape Town. 2015. ↑ Beselga C, Neto F, Alburquerque-Sendín F, Hall T, Oliveira-Campelo N. Immediate effects of hip mobilization with movement in patients with hip osteoarthritis: A randomised controlled trial. Man Ther. 2016;22:80-5.